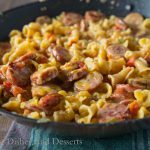 Cheeseburger Macaroni Skillet – Ditch the box mix Hamburger Helper and make this homemade version instead! Dinner is ready in minutes, with just a few pantry ingredients. The second week of school and I am already tired of packing my sons lunch. This is not a good sign. He has seen my Instagram feed with all the pictures of fun and creative lunches that kids are getting. And now, he wants that. For the last year, he wanted the same thing in his lunch every, single, day. This year, not only does he want to change it up (which is perfectly fine with me), he wants it to be fun and different most days. I was at the store the other day and saw one of those divided tupperwear containers on sale, so I picked it up. Now it is time to figure out what to put in it. I am just not that creative early in the morning! 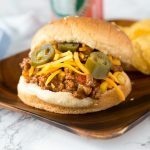 Yesterday I shared with you over 30 great back to school dinner ideas. All recipes that are ready in less than 30 minutes, so they are perfect for busy weeknights. 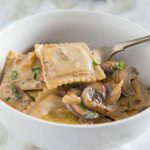 Today I am here to share yet another quick and easy dinner idea. 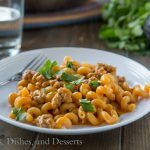 It seems that most Americans grew up with Hamburger Helper being kind of a staple around the dinner table. It isn’t hard to see why either. Brown some ground beef; add noodles, a seasoning packet, and water; and let it simmer until done. You really can’t get much easier than that. But, you can get better tasting, and almost as easy! 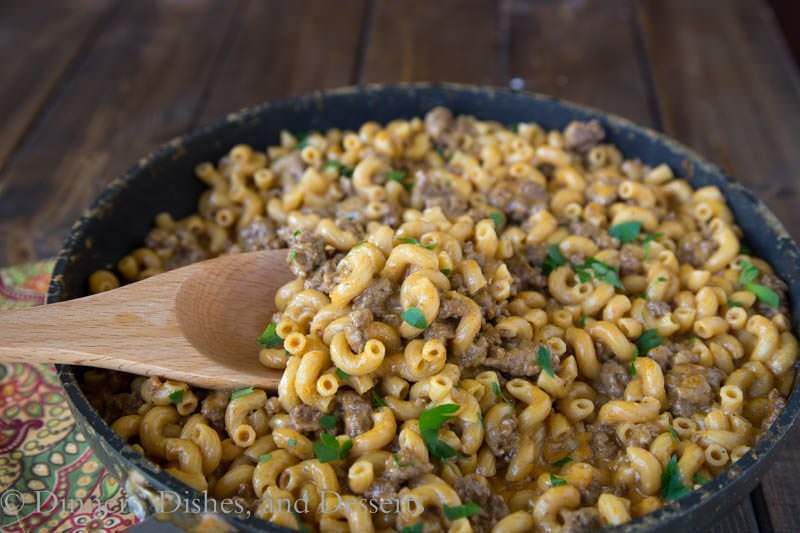 Trust me, this Cheeseburger Macaroni Skillet is ready in the same amount of time, and you will feel so much better about feeding it to your family. 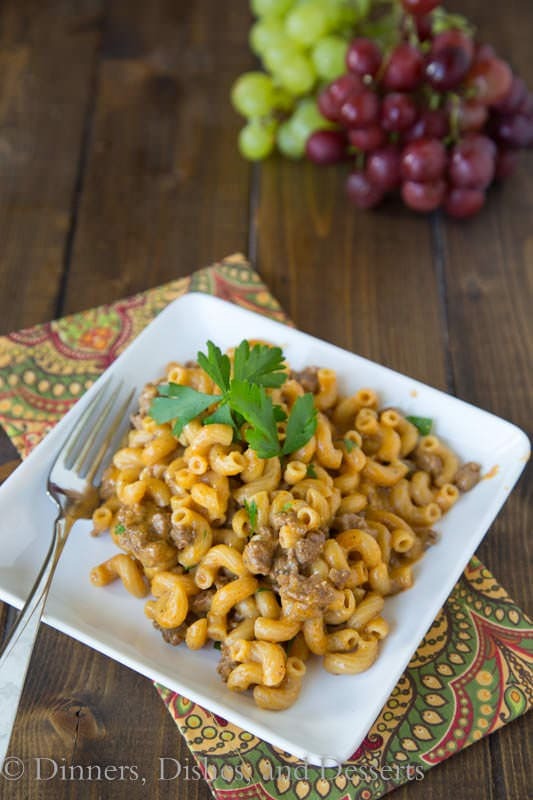 A homemade hamburger helper you can feel better about feeding your family. 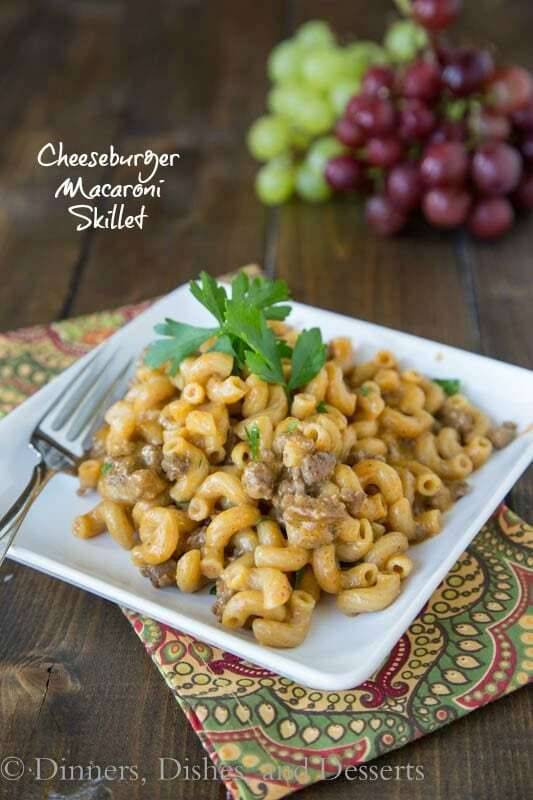 The same components in the box mix, make an appearance in this Cheeseburger Macaroni Skillet. The main difference is you have to measure the seasonings yourself, but this also means nothing fake is involved. AND you get REAL CHEESE!! 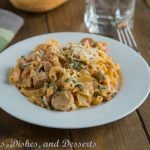 A piping hot, meaty, creamy, cheesy supper the kids and grown ups will love, and only 20 minutes worth of work. You will never go back to the box mix again! Serve with fruit, a salad, roasted asparagus, or even basil garlic bread. You can make pretty much any flavor at home. Homemade Hamburger Helper Lasagna is another of our favorites. 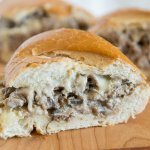 So easy to make, and everyone loves it! 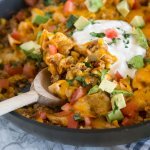 Taco Pasta Skillet is another that is kind of a take on the box mix. So much better with fresh ingredients! The leftovers were just as good the next day for lunch too! 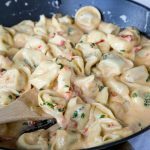 One pan dinner recipes are kind of my favorite things. And this Kielbasa and Pierogies Sheet Pan Meal looks incredible. Does your family like fish? Try this Sheet Pan Salmon for a quick weeknight dinner too! 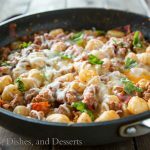 Comfort food in one pan?! Yes, please! 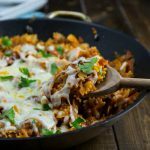 The perfect quick and easy – and hearty! – dinner! This has to be a family favorite on your end. I know it would be on my end. Making it again tonight, everyone loves it! This was great! 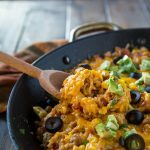 We ran out of hamburger helper and needed a quick meal, my husband loved this! I loved how simple it was and not with a lot of crazy ingredients. Had everything I needed right at home! Thanks so much! So glad that you enjoyed it Kim!! 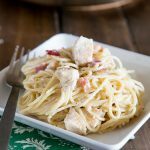 I make a version of this during the winter months, it a staple in our house. I just made this tonight, delish! Definitely filled the nostalgic Hamburger Helper craving. My 3 year old and 4 year old both said they loved it, huge victory. The sauce ended up a bit on the thin side, I think I will scale back the liquid next time. Also I might try cooking a couple tablespoons of tomato paste in with the beef to give it just a bit more depth. Yum! My husband liked it but it was a little on the bland side. I’ll be making a batch of the basic dry HH mix and try it with that. I think kids would love this dish since its not complex on flavor but for adults, it needs something. We like to change up the meat and use spicy italian sausage or chorizo to add more flavor. Love finding good one pan recipes! Especially ones that can help me replace box made hamburger helper! Really excited to try this one out, and probably over do it on the garlic, cause I love garlic! Cheers! Thanks for posting Erin!